The island of Ko Samet is situated 180 kilometres (108 miles) from Bangkok and 80 kilometres (48 miles) from Pattaya on the south-east coast, off the Gulf of Thailand. Although huge tourist related development began shortly after the island was declared a national park in 1981, this six-kilometre long island boasts dazzling soft white sandy beaches and sparkling blue waters. The island gets its name from the Cajeput Tree, whose origins came from the Melaleuca family name which is native to tropical parts of Australia and the East Indies. Samet is the Thai name given to the word Cajeput. The Thai colloquial name referred to this breathtaking piece of paradise was Ko Kaew Phitsadan or the more aptly English name of - Magic Crystal Island. Records show that cajeput trees are also affiliated to white wood trees, white tea trees and swamp tea trees. They are all evergreen with either white, red or green flowers and long, flexible trunks with irregular ascending branches. The tree leaves are pointed, ash in colour and alternate on short twig like stalks. Cajeput or tea tree oil is then distilled from the fresh leaves and twigs. Tea tree oil is very high in essential oils and used in both aromatherapy and herbal remedies. Legend says that once upon a time and a long while ago, Ko Samet was home to pirates who hoarded their captured loot on the island. To this day, some believe there is still lost treasure buried somewhere on the island. So not only can you enjoy a blissful vacation, there's also a chance to go home much richer. Don't forget to pack the metal detector in your luggage before leaving home, but don't tell anyone I gave you this information. Ko Samet just might become the next major tourist destination. Most of the pristine white sandy beaches are situated on the eastern shores of the island surrounded by tropical coral reefs and crystal clear waters all the while hiding in small bays that stretch an average of some 200 meters each. Ao Hin Kok is separated by a small rocky outcrop from Hat Sai Kaew and where the flute player and the mermaid statue is located. This pristine beach, famous for its strange shaped rocks, is half the size of Hat Sai Kaew. There are few, but mostly cheap lodgings in the form of bungalows and huts located along the beach as well as some reasonably inexpensive restaurants catering for a variety of seafood dishes. Koh Samet is amazingly quiet and relaxing on the weekdays but can be raucous and fun on the weekends. 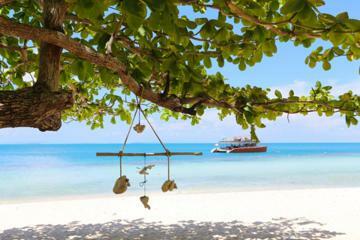 Koh Samet is, despite its proximity to Bangkok, a beautiful island with powdery white sand, generally great year-round weather and a variety of lodging options. All the more reason to visit this special island. And if you'd like to get an introduction to the real lifestyle here, why not take the hassle out of trying to navigate everything yourself by taking a tour to get yourself acquainted. To get started, you can check out the detail in the link above. If you should book this tour from my site (at no extra cost to you) you'd not only be giving me a little extra pocket money, but you'd also be helping me maintain this blog so that I may continue giving you more travel information on this beautiful part of the world. Wishing you all a safe and pleasant journey. Hat Sai Kaew meaning Crystal Sand Beach in Thai or Diamond Beach in English is situated at the most northeasterly point on the island. This one kilometre long and 25-metre wide beach is not only breathtakingly beautiful, but it is also not surprisingly the most popular. From sunrise to sunset, the beach is a hive of fun activities including a host of water sports on offer such as jet skiing, windsurfing and scuba diving or you can simply relax in the warm sunshine or go for a dip in the ocean. Ao Phai is a small but stunningly beautiful beach situated close to Hat Sai Kaew offering a lifestyle fit for total relaxation. This beach is less crowded, the sea is calm, clear and warm making it the perfect spot for sunbathing and swimming. More importantly, this beach is extremely safe for your kids. Coconut trees and a few beach umbrellas can be found on the soft white sandy beachfront, allowing you much needed shade should the sun get a tad too hot. The Samed Villa Restaurant found at the end of the beach serves Thai and European cuisine for your eating pleasure. Ao Nuan is a small secluded bay with the only real access being by foot from either Ao Tub Tim Bay, a short distance away to the north and Ao Cho a short distance away to the south. It is a perfect hideaway for anyone wishing for a little peace and tranquillity. Not much in the way of upmarket accommodation at Ao Nuan but if you decide to stay, you could easily take a leisurely stroll to some of the bars and restaurants that are not far off. This could be a little tricky late at night, though. The main departure point from the mainland is from the small fishing port of Ban Phe, which is situated approximately 17 kilometres or a little over 10 miles east of Rayong. Depending on which direction you arrived, it would be easier to take a bus or drive to the town Rayong as there are no known transport facilities that would take you directly to Ban Phe. Once in Ban Phe, you would need to decide as to which beach you would like to visit and then choose the correct boat accordingly - unless of course, you book a pre-paid package tour.